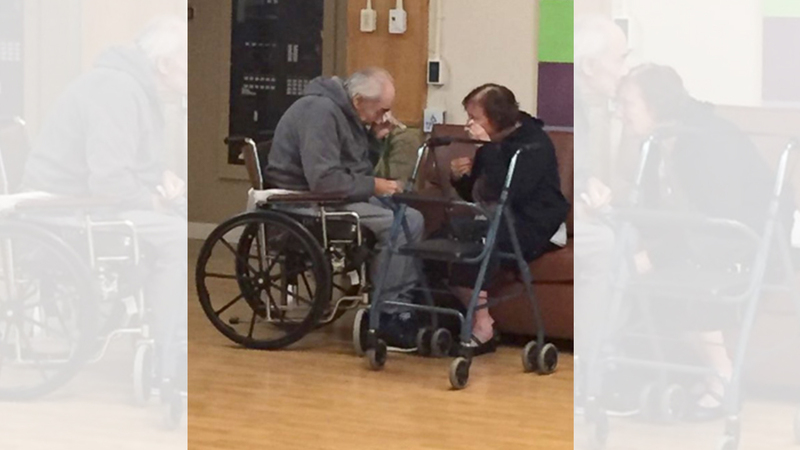 BRITISH COLUMBIA, CANADA -- The story behind an elderly couple's viral photo is even more heartbreaking than the image suggests. The emotional photo was taken by their granddaughter, Ashley Bartyik, during a visit to see her grandparents. ABC News reports that Bartyik is worried their "heartbreak and the stress could literally kill them." Bartyik posted the photo on Facebook and it has been shared thousands of times. Wolfram and Anita Gottschalk, of British Columbia, Canada were apparently moved to separate nursing homes a few months ago. The Gottschalks have been married for 62 years. Due to backlogs and delays by their health care system, they will be separated for a total of eight months. Wolfram Gottschalk, 83, was first put in an assisted living home in January for health complications from dementia. Four months later, Anita Gottschalk, 81, entered assisted living, but was put into a different home than her husband. Wolfram was placed on a waiting list so he could move in with Anita, but is still stuck without his sweetheart. Bartyik says her parents drive Anita to Wolfram's center at least every two days.